My two dogs are a huge part of our family! Lulu and Kipling pretty much think they’re the stars of the family and I can’t say we do much to change that. They are definitely pampered. By every single one of us. 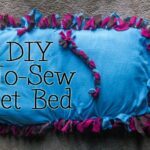 The kids love to make things for the dogs, from their hand painted food and water bowls, to their diy no-sew pet bed and even diy no-sew dog toys. 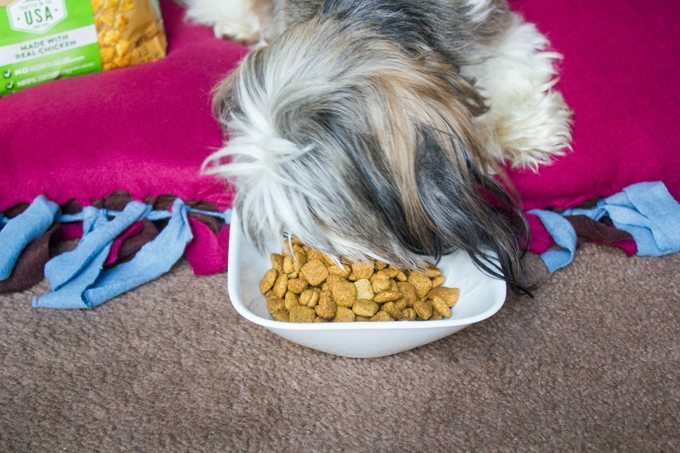 We love to recycle items to make them something new and different for the dogs. 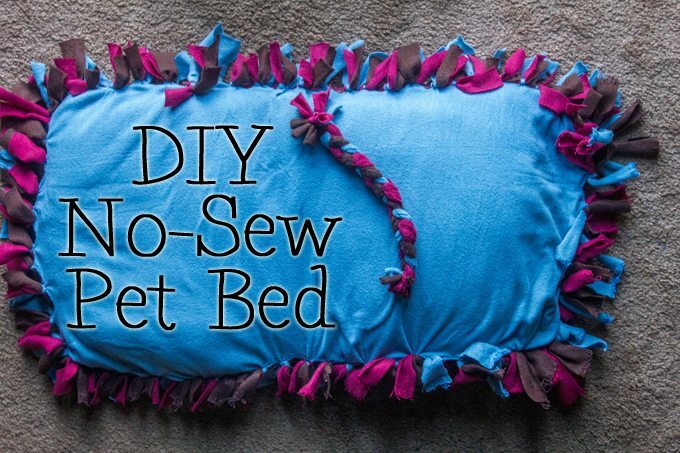 This awesome DIY No-Sew Pet Bed is made with recyled blankets or sheets and an old pillow. At the bottom of this post is a printable version of this without the photos. 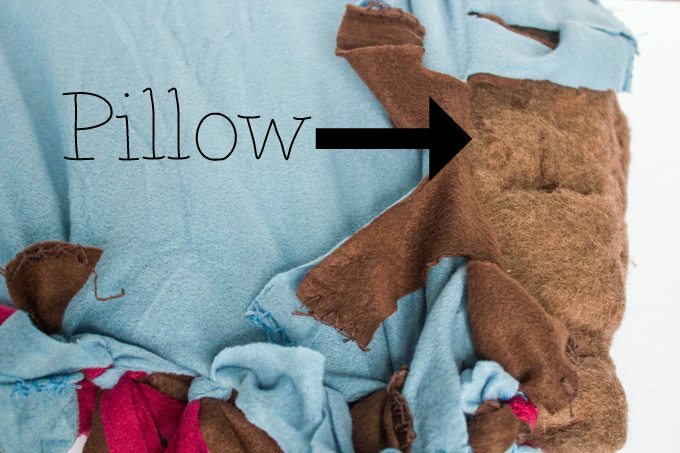 Notes: For the inside, we used the insides to an old throw pillow that we cut apart. 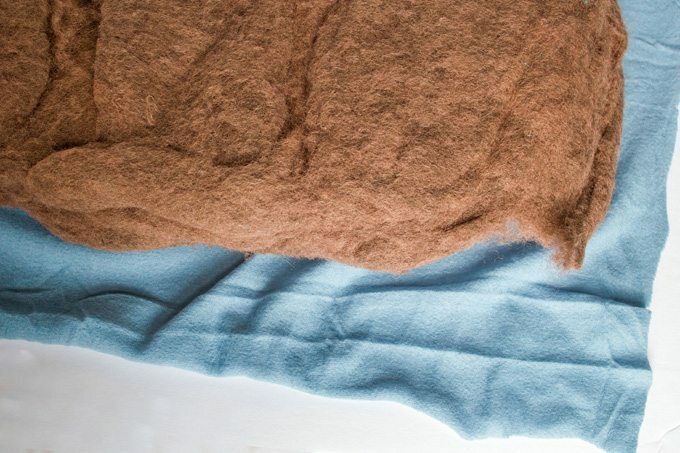 You can also use a piece of foam or even stuffing. For the outside, we used some really inexpensive blankets we purchased after Christmas on clearance for .99. 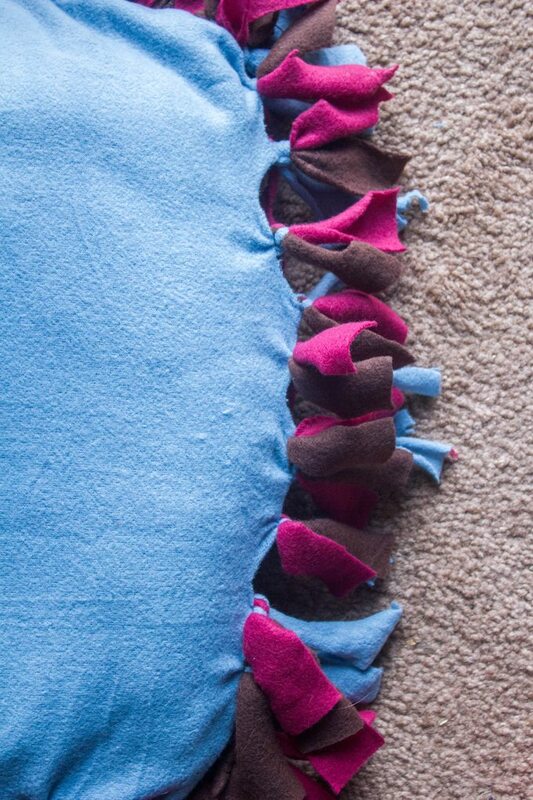 You could also use an old blanket, sheets, or have fabric cut for you. 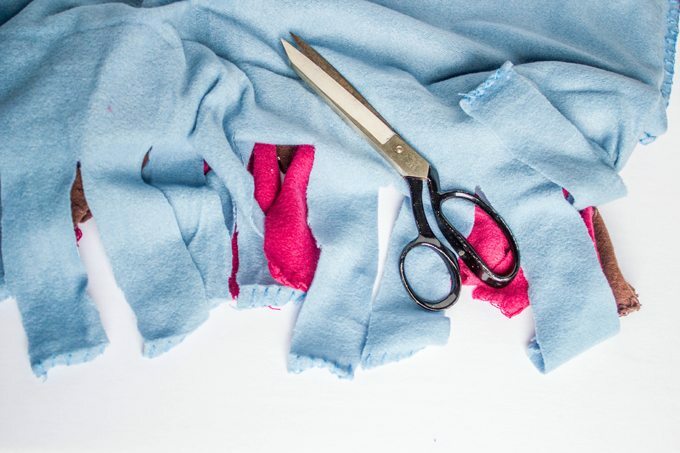 Step 1: Cut both pieces of your fabric to desired size – this is going to depend on how big or small your dog is. We made this one for our new puppy, so it’s much smaller than one we will make him when he’s full grown. I basically found a pillow I wanted to use as the inside. 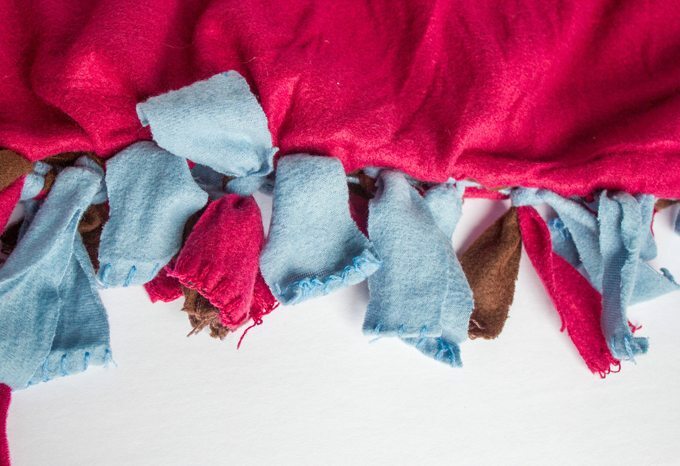 I laid it out on the fabric and cut around the pillow leaving about 4″ all the way around for the fringe. I also just hand cut it, I didn’t really care how unevenly I was cutting. Step 2: Line up the edges of both pieces of fabric. Cut a square out of each corner. Step 3: Cut your fringe. I basically cut a slit about an inch apart all the way around. Step 4: Tie the fringe into double knots along three sides. You can do this while watching tv, which is great. Step 5: Take your pillow and stuff it inside careful to make sure it is inside, the correct way. Step 6: Tie up the remaining side of fringe. Step 7: Beg your puppy to cooperate so you can take cute photos of him on his new bed. 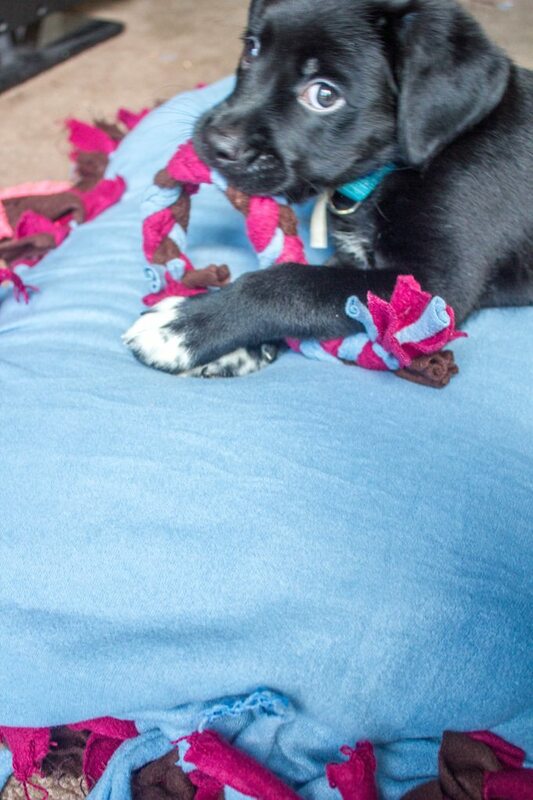 Give him a toy to chew on but be prepared, all photos will be blurry because he never.stops.moving! Step 8: Take a photo instead of your older dog, because she is better behaved and crawled right on top and went right to sleep. Lulu loves Purina® Dog Chow® Natural. She’s a very picky eater, so when we find a food she will eat, we stick to it. She loves the taste and it’s affordable. 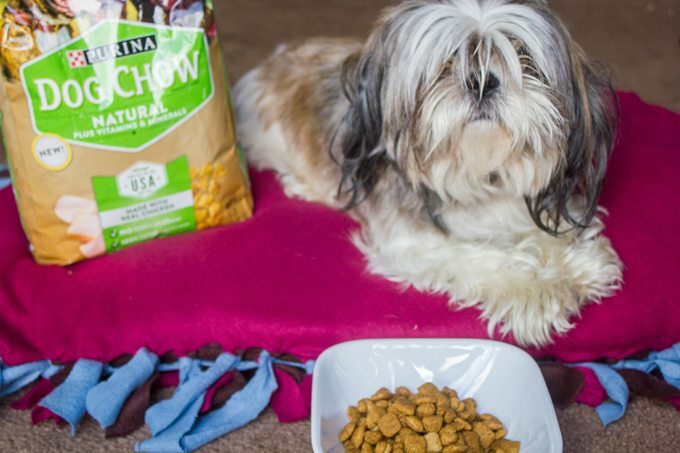 Purina® Dog Chow® Natural offers high quality nutrition made with quality protein, real chicken, and entirely free of artificials and preservatives. Score for me! Score for Lulu! We buy our Purina® Dog Chow® Natural at Kroger, because it’s convenient and the price is right! I love that I can grab the ingredients for dinner and also pick up dog and puppy food to keep my friends well fed too. Both Kroger and Purina make it easy for me to give Lulu (and Kipling) the star treatment while saving ME time and money. I was also pretty excited to find out that there is a Puppy Chow Natural, which I am now using for Kipling. He loves the food too, and has gotten to the point where he turns his tiny nose up at anything else. It truly must taste that good! Look for $3 off Dog Chow coupon in the Purina 7/31 insert in your local Sunday newspaper –and use it at Kroger. In this same insert, there will be $19 in Purina product savings including Tidy Cats, Dog Chow, Fancy Feast, Alpo, and DentaLife dog & cat dental treats. 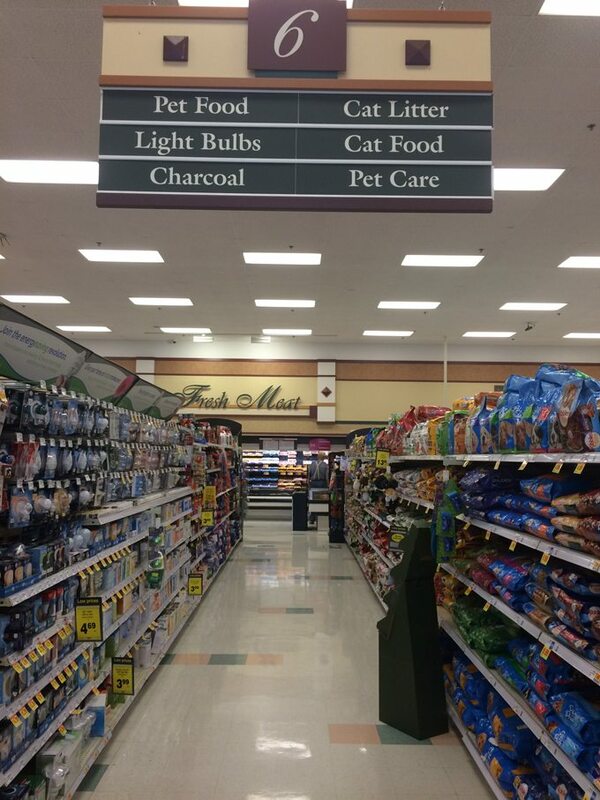 You can get everything you need for your pets! Digital Coupons: Purina brand coupons will launch 7/31. There will be a $2 off Dog Chow Naturals dry dog food coupon, a $1 Off Tidy Cats Lightweight Litter coupon, and a $1 Off Tidy Cats Litter coupon. There will also be several other Purina coupons available on the Kroger coupon page. 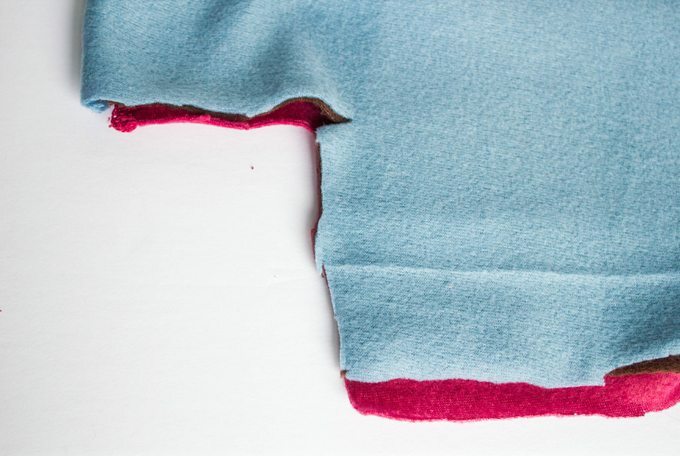 Cut both pieces of your fabric to desired size – this is going to depend on how big or small your dog is. I found a pillow I wanted to use as the inside, laid it out on the fabric and cut around the pillow leaving about 4? all the way around for the fringe. I also just hand cut it, I didn’t really care how unevenly I was cutting. Line up the edges of both pieces of fabric. Cut a square out of each corner. Cut your fringe. I basically cut a slit about an inch apart all the way around. Tie the fringe into double knots along three sides. You can do this while watching tv, which is great. Take your pillow and stuff it inside careful to make sure it is inside, the correct way. Tie up the remaining side of fringe. 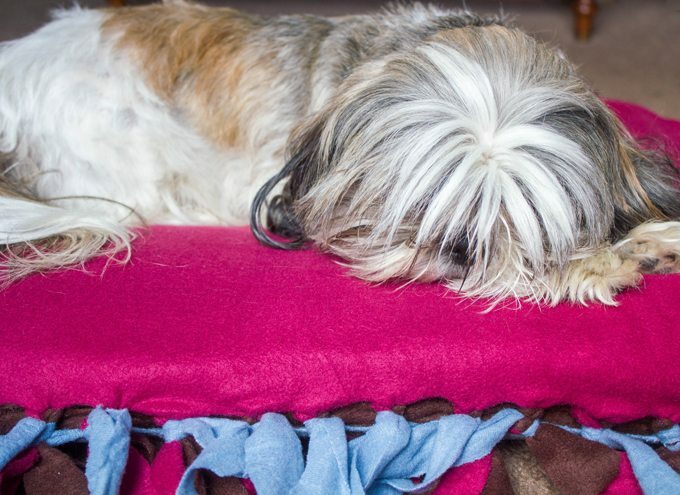 Have you ever made anyting fun for your pets and given them the star treatment? Please share in the comments below! Love this recipe! You mentioned you make your own dog food also. I checked and couldn’t find it on your site. Would you be willing to share it with me?